Big Brother or little gnome? "... The line between state oversight and interference can be a fine one; and the same system which can provide generous benefits might also insist on similarly high levels of co-operation. Jo Fidgen is in Sweden, where a sort of 'Big Brother' is watching you, even in your own home. But she finds that even this level of supervision seems to some a way to find freedom through big government, via the Swedish welfare state – or the "People’s Home", as its taxpayers prefer to put it." We believe we can think and talk freely. We can not. Hidden rules cut out real thinking. These rules were made by the church in the middle ages to force people to be obedient. These concealed rules still control us. Therefore, we can feel frustration – but can’t find a way out – because the system is made to work this way. You have, simply, no words or relations that can give any real meaning. You can complain. But you can’t form the next step. Every alternative to what is established is doomed to be regarded as stupid. This system, this vicious circle – where Might is the only Right – is usually called the Western tradition of thought or the Western mind-set. When we have gotten rid of these hidden rules we will be able to take care of our opportunities and of each other. The Real Enlightenment has begun – to reach real thinking, real science, real democracy and to end the suffering that The Western Curse ignites. The rest will follow in same days. 23 September 1966; published May 31 1976. There can not be any doubt that Heidegger was the last, so-called philosopher, in the western tradition. In this interview Heidegger pinpoint the wall – what he – and we – refuse to talk about. This is the ”Geworfensein” – the word Heidegger invented to catch that we are thrown out of our own lives – because we are forced to not talk about the essential stuff. The result of terror – denial – can only be suffering – and the turmoil of today. So, I cut up the wall of taboo – and the Western mindset will be gone. Read the latest The Economist, Jun 9th 2012. 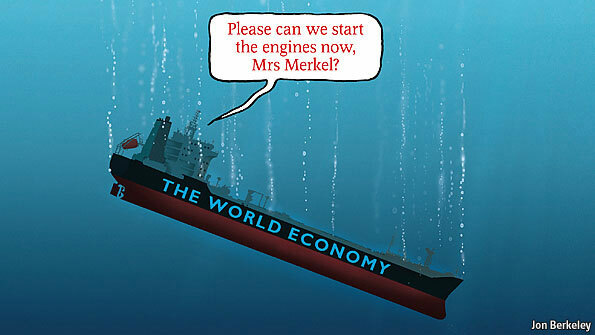 They have a perfect cartoon of the ship “The World Economy” sinking. The World Economy IS of course the western tradition of thought or the western mind-set – what else can it be – we are sinking – because we are trained to be like stones. "You can’t learn to write in college. It’s a very bad place for writers because the teachers always think they know more than you do—and they don’t. They have prejudices." Get More Bost and Cutler - Now!